Here in South Carolina we have been super blessed with warmer temps these last few days. It definitely makes it feel like Spring, especially when daffodils are blooming everywhere. 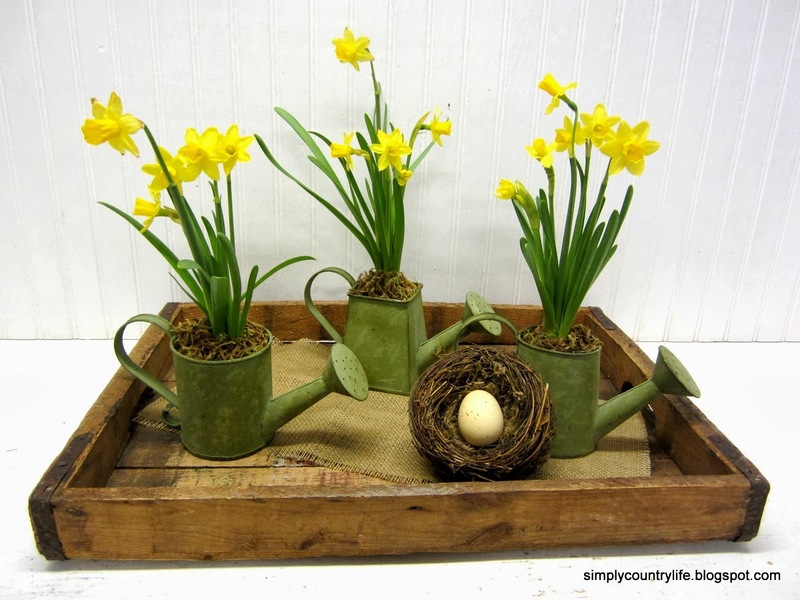 I brought a little spring indoors today by creating a centerpiece using daffodils, a rustic wood tray and a few thrifted watering cans. and purchased them to use this spring. 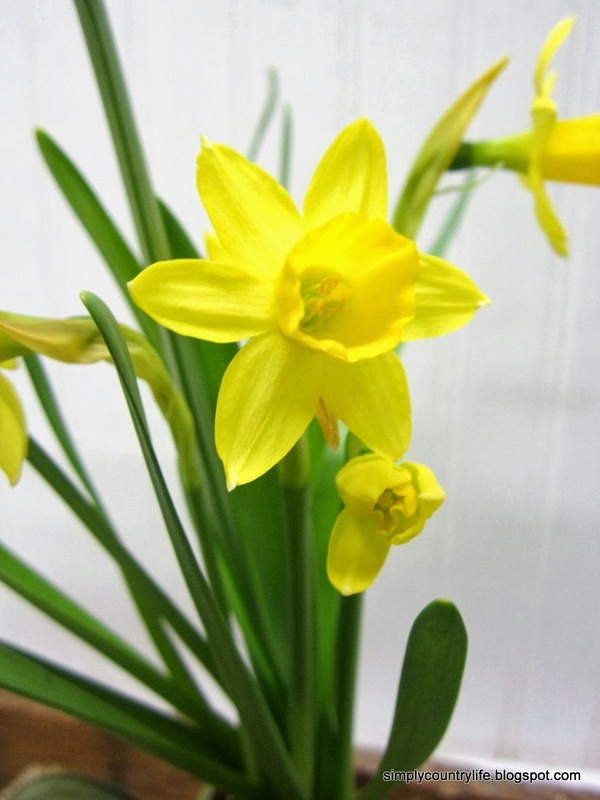 Daffodils are so bright and cheerful. I definitely wanted to incorporate them into my spring decor. Although, I wasn't really sure how I wanted to do it. 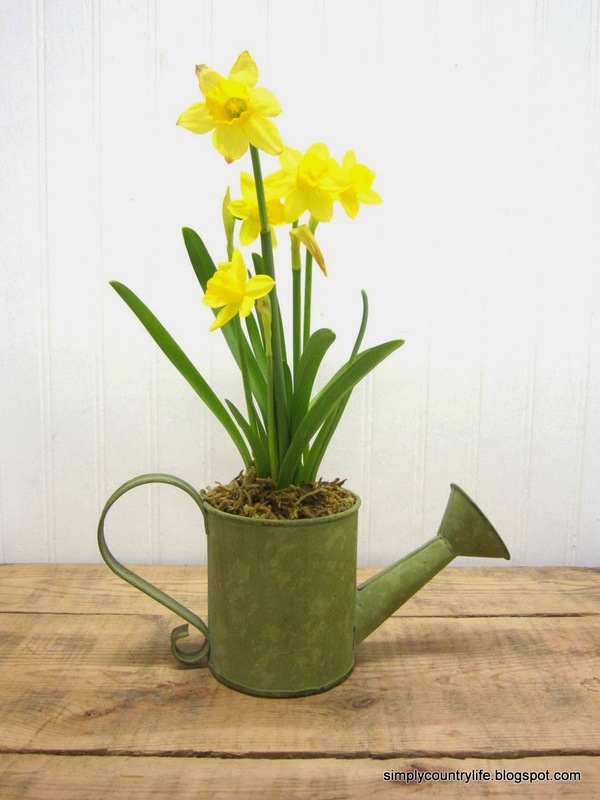 place a bulb of daffodils in each one. Lucky me, I had to go grocery shopping today. You are probably wondering what was so lucky about that. Well - the lucky part was that the grocery store had individual daffodil bulbs for .98 cents! 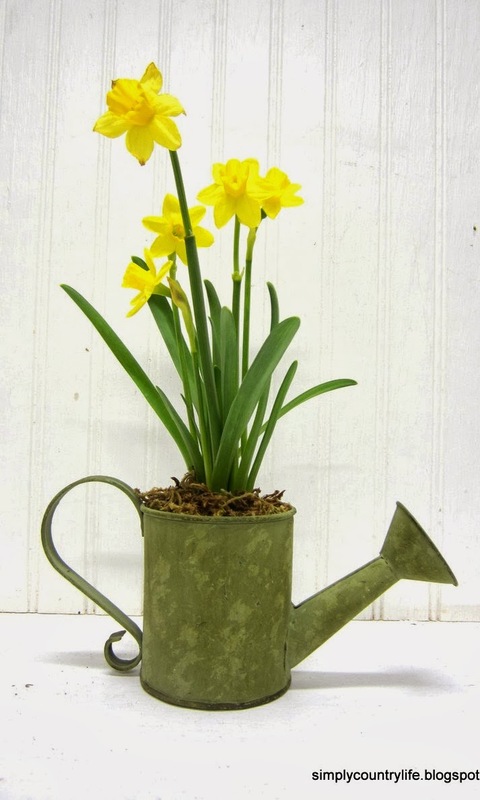 I replanted the daffodils into the watering cans and covered the dirt with moss that I had. I decided to arrange them on a rustic wood tray. I added a piece of burlap to cover the ugly painting on the tray. Lastly, a nest with an egg, that I already had, completed it. and then it will be just about time to create an Easter centerpiece. 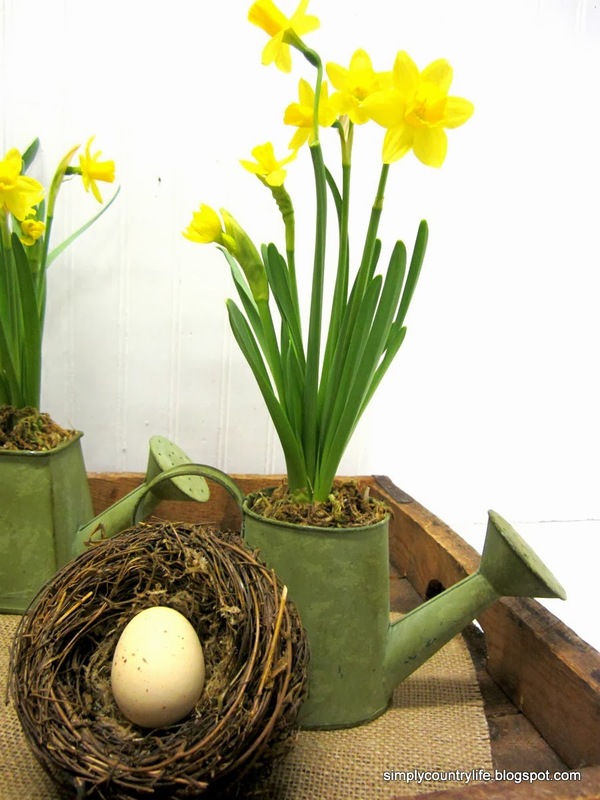 You can take a peek at last years Easter centerpiece here. It is a Martha Stewart copycat. Have you brought any bright blooms into your home lately? If so, what kind of flowers were they? I hope these brighten your day and bring you some warmth. Good Morning Adina - I love your center piece. So perfect for spring! I am in love with that rustic tray. I have been bringing fresh flowers lately, and putting them in a white pitcher on my dining table. Don't you just love fresh flowers Sherri. I know I do. Flowers in a white pitcher is by far my all time favorite centerpiece! Thank you so much for being such a blessing to me. I hope you have a wonderful week. What a cute idea. I love flowers and I'm so ready for spring. I love the nest of eggs too. Thanks for a great idea, I often loose inspiration when it comes to center pieces. 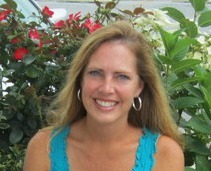 Sami - thank you so much for stopping by and for the compliment! It actually looks better in our cabin than in these pics. I think the yellow pops more against our dark table and the log walls. I adore daffodils! I have bulbs started for an Easter centerpiece. I'm not hosting, but instead creating a hostess gift for my grandmother. Oh I'm sure your grandmother will love it! How thoughtful of you. 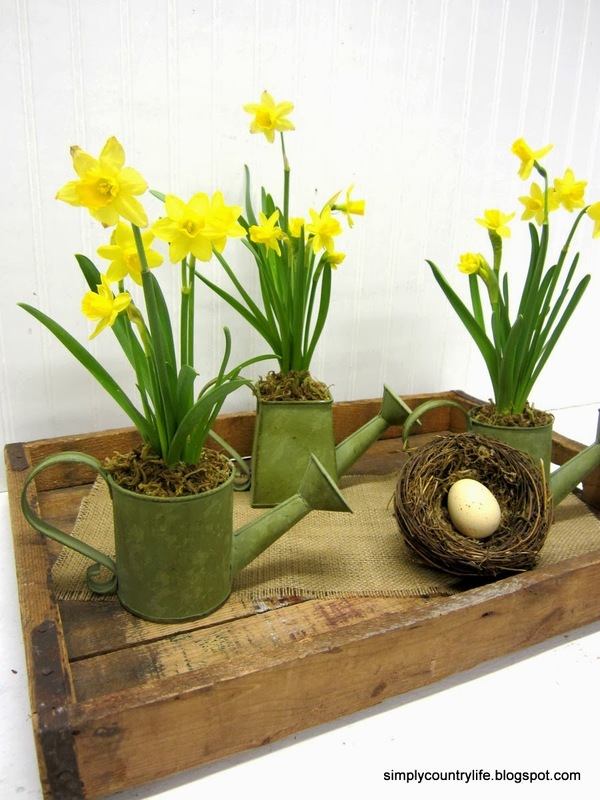 Daffodils seem to brighten any space!